Now you can have a midsized Sports Utility Vehicle that’s a good travel option for you and your family, Chevrolet unveils their new family classic Equinox repackaged, revamped, and ready for the road! Check out the latest 2011 Chevrolet Equinox and its features that will make for a good trip whatever the destination. When you first take a look at it, you will find that it’s the same SUV introduced in the model year of 2010 as well, yet there are styling highlights like a single horizontal grille that’s a swell touch of Chevy’s strong name and make, bold wheel arches and a raked forward stance and also the illusion of a wrap-around tailgate glass that’s completely clean and pristine. The chassis and overall body construction are essentially old school that employs a truck type construction which is called the Unibody, which makes for a lightweight design to improve fuel economy and handling. And as for the internal makes and engine makeup the 2011 Chevrolet Equinox offers four- and six-cylinder engines and a choice of front- or all-wheel drive! The engine employs the precision of advanced direct fuel injection to enhance power and fuel efficiency. The four-cylinder is a 2.4-liter from GM’s Ecotec family of engines. At 182 horsepower and 172 pound-feet of torque, it’s among the more powerful four-cylinders in the class. (Torque creates pulling power and throttle response; horsepower sustains momentum.) The V-6 available in the Equinox is a 3.0-liter with 264 horsepower and 222 pound-feet of torque. That horsepower figure is solid but most rivals use V-6s of 3.5- to 4.0-liters that furnish substantially more torque. 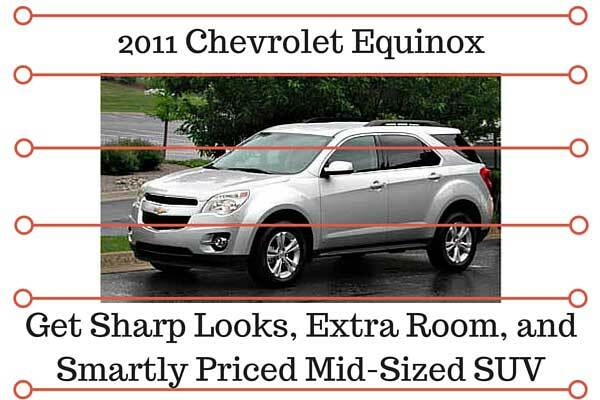 All 2011 Equinox models should continue with a choice of front-wheel drive or extra-cost all-wheel drive (AWD). Front-drive places the mass of the drive train over the tires that propel the car, a traction advantage on slippery surfaces. These specs are not bad at all as well, so you could equip yourself on the road whatever the terrain. Get smart prices ranging from $24,495- $27,720 from a good Chevrolet dealer as well, it’s a good ride when you travel!